Does dating freak you out? If so, I’ve got three tips to turn your fear around! In this Dear Gabby video, I offer soulful guidance on how to be a great date. If you’re already in a relationship or married, use these tips to reignite the spontaneity, authenticity and romantic spark! 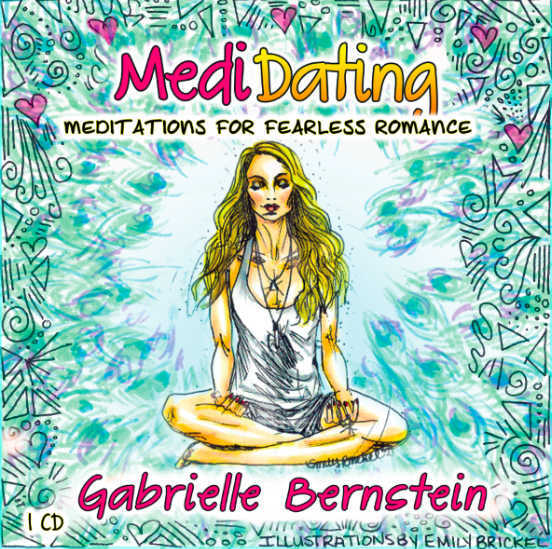 If you’re ready to release fear around romance and have more fun while dating, check out my MediDating meditation album! In this 11-track album I help you release romantic illusions, overcome fears and insecurities, activate your attracting power and manifest love into your life. Through simple breathing exercises, visualizations and mental reconditioning, you’ll simplify and enhance your dating experiences, all the while using your inner guidance to find the perfect partner! Let it go. Relax and have fun! I have a date coming up very soon and this arrived in my inbox, had to watch it! I’ve been trying to manifest a romantic partner but in the process I realised I needed to address some of my own beliefs about romance and love. As I engaged in this introspection, I found myself unable to provide an acceptable answer as to why I wanted a man in my life. Do you have any thoughts on this? Or resources I can turn to? So I’ve done my work, I’ve read Spirit junkie (I’ve read all of your books) and Calling in the one and like a hundred more in that category. When I’m actually on a date, I’m doing great, and men seems to like me and want to be with me. My biggest issue has been my ex boyfriend, as I’ve been unwilling to let him go. I’m doing everything in my power to forgive and release him, I really want to, and I’m not entirely there yet but I’ve asked for the angels to help me and I have faith that they will. I’m really confused though, as I’ve been single for a long time now and I thought that if my focus shifted from my ex to calling in someone new, it would be effortless and that men would come flooding in :). Instead, I can’t seem to meet ANYONE, not even online, there’s like no single men around me at all. I’m trying to call them in with the meditations from Medidating but I have no sucess. I’m keeping my head cool and I’m trying to not get needy or desperate. Am I trying to much? Do you have any advice? Something to think about: How can you start a new relationship when you have not let go of the old!? You are cheating yourself! I’ve been single for 3 years :-). I’m not cheating myself as I’m fully aware of the situation , but how should I ever be able to move on if I’m never out dating? I’ve had a bad hang up with my ex, I’m trying to move on – what do you Think I should do then? Don’t know if I’m double posting now as it didn’t work before, sorry if that’s the case. Debra – what do you Think I should do, then? Stay at home and continue to obsess about my past? I’m trying to move on and create a new future for myself. I might be ceating myself, I don’t know – that’s why I wrote for Gabbys advice :). sound like there is more clearing to do… have you checked out the resources below.. calling in the one is an amazing book for clearing. Your advice is very good! Are all your clients straight women? I thought you had a bigger reach to humans, male, female, gay, straight. As a gay woman I was taken back as I listen to your videos. HI all, I added a disclaimer at the top of the blog. Apply the tips to men or women:) Thanks for chiming in Caroline. Thanks for sharing very fantastic videos and spreading wisdom and knowledge through your precious videos I really I appreciate all of your tips and advices and I try to follow them whenever I get chance. I had a date 1 month ago with Girl, by the way I am 27 old male from US. Everything went well through out the time it was just few hrs 1st meeting. She left me saying if she like to continue build up connection she will inform me. After 2 days she sent me message and then she completely shut down saying I can’t chat because I (she ) realized she has some personal issues which she needs to deal with and now I really wanna be with this girl but nothing I am on hold. I pray that in future she will contact me but I dont know what and where my life is taking me and what is universe telling me through all of these..
Will you guide me what is the best thing I can do please? Thanks a lot for this advice Gabby. I will definitely do it as you just mentioned I trust that there is something out there in universe more powerful and bigger and beyond my fears. I highly appreciate your healing advice. I always love your insight – honest & genuine! Someday I’d love to hear your thoughts on how to handle the post-date clarity/realization that you’re not interested in the guy (this anxiety actually holds me back from going on dates to begin with!). What do you say? What’s to kind/right way to handle that? it’s okay… you’re sorting through who is right for you. thank the last guy for showing you what you don’t want. Gabby, How do you suggest a freshly new couple approach the monogamy or “Please, no other emotional/physically involved parties” conversation? How would you advice a Sprit Junkie to approach this convo with cool and calm? I want to making extra sure both my Dude and I are same page about entering into a sexual relationship in order to be honoring my highest truth which is to care for my mind, heart and body. So I still have feelings for my ex who I haven’t been with for about 5-7 years. Even though he lives in another state and has a partner and child, I have always hoped our paths would cross again and we would be together. Do I tell him how I feel or just leave it bury those feelings deep down like I have been for ages? I know that nothing would probably ever come of it, but he thinks I don’t care about him, but it’s actually the opposite. Do I throw that information out there for him to do with it what he pleases? Any advice would be so gratefully appreciated. Thank you Gabby beeing so inspiring and let the light shine <3 🙂 You go girl. Hi Gabby, your video really impact point to me about when know exactly things we want to do, the feeling we want when do them, that work really take we become more control and don’t waste time for stupid things.It also help we take advantage of opportunities when them appear. I thought this video was great and i watched the video before going on a date. I went trying to be totally myself and had a couple of wines to try and calm the nerves. I had thought the date went well but never again heard from him. I am struggling with the fine line of maybe being too relaxed or sharing too much and being stiff and not allowing yourself to even relax and have a drink. Ever since the date I have been playing things over on how i could have reacted differently. I love your videos, can you do more on dating. I see this article is quite old but I loved your video how to be a great date, Gabby. Some great advice for me to work with, thanks and good luck on your blog.